I first read about this book on Ann’s blog, Patternings and thought it would be one I would enjoy, so when a friend gave me a book token for my birthday I bought it. Many thanks to both of you – this is an excellent book. I’ve read so many good books recently I seem to be saying that a lot. 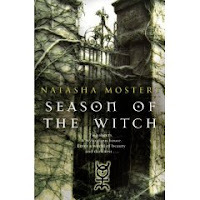 Season of the Witch is a thrilling, spine tingling story of mystery, mysticism and magic, abounding with symbolism. It’s a modern day gothic epic, mixing computer technology with witchcraft, alchemy and the power of the human mind, in the search for enlightenment. ‘Gabriel Blackstone is a cool, hip, thoroughly twenty-first century Londoner with an unusual talent. A computer hacker by trade, he is – by inclination- a remote viewer; someone whose unique gifts enable him to ‘slam rides’ through the thought processes of others. But reading people’s minds is something he does only with the greatest reluctance – until he is contacted by an ex-lover who begs him to use his gift to find her stepson, last seen months earlier in the company of two sisters. The mystery of Robbie’s disappearance leads Gabriel into breaking into Monk House and there are many passages which I felt I had to race through to prevent him from being discovered; that nervous tension anticipating danger that you feel watching a horror film build up leaving me breathless as I read. I find it hard when reading a book to take notes at the same time as it breaks the flow of my reading and then I struggle to pinpoint exactly what I particularly liked and where in the narrative things occurred. The pace of this book was making me read so fast that I knew I had to slow down or I’d never remember anything except that I liked it. So every now and then I stopped to take stock and after about 100 pages I did start to jot down some page references. Minnaloushe and Morrighan Monk (wonderful names), the beautiful mysterious sisters are descendants of Dr John Dee, a mathematical genius, alchemist and secret adviser to Queen Elizabeth I. Minnaloushe similarly is a mathematical genius who constructs a ‘memory palace’ a mental aid to enhance the memory in the Renaissance tradition. Morrighan is the strong, athletic, risk taker. Both of them bewitch Gabriel as he seeks to unravel the mystery behind Robbie’s disappearance. Alchemy is really the transformation of the spirit into a higher form of consciousness. Enlightenment. Coming face to face with God and discovering His motivations for creating the universe and your own place within it. One of the themes that interested me is that of memory, so when I read ‘ we forget what we’ve read almost as soon as we’ve read it’, I couldn’t agree more. The memory palace was a technique originating with the ancient Greeks, which was later developed by alchemists and Gnostics during the Renaissance. A form of mnemonics. These days we use so many aids to memory that don’t actually involve remembering, so much as finding out where to find information. We don’t commit things to memory so much as people did in the past – our minds are shrinking, a horrible thought. It comes as no surprise to find out that the sisters’ mother had Alzheimer’s, which triggered Minnaloushe’s interest in the subject of memory. Minnaloushe’s hypothesis is that ‘Man’s soul is inextricably bound to his power of recollection.’ This is a disturbing thought and I remembered my feeling of dis-ease when reading Deborah Wearing’s biographical account of her husband Clive’s amnesia in Forever Today. A virus attacked his brain destroying that part essential for memory, leaving him trapped in a limbo of the constant present. He had been a BBC music producer and conductor and the musical part of his brain seemed unaffected as well as his love for his wife. The constant repetition of the same thing over and over is harrowing, every moment was new and every thought the same. Eventually his memory began to improve. I’m also reading The Remainder by Tom McCarthy, another novel on the themes of memory, amnesia and identity. I’m finding this hard going at the moment as it seems to be going over and over the same ideas, reflecting the state of mind of the main character as he tries to regain his memory. As I haven’t finished it all I can say now is that it’s a disturbing book and I found myself thinking this is just not real – strange really considering I can easily accept complete fantasy as ‘real’. Another reason this has piqued my interest again is Shenk’s account of Ralph Waldo Emerson’s senile dementia, and because of Stefanie’s posts on Emerson at So Many Books I know more about him than when I read Shenk’s book. This post has digressed from its original topic but I’m so glad I read Season of the Witch – a compelling read, which has given me much to ponder and led me back to other books and forward to yet others. I see that Natasha Mostert has written other books – see here for more information. This is the first book of hers I’ve read but it will not be the last. Thanks for this review. Being a Wiccan Faery Witch, I am always intrigued by novels with Witchy titles. Sometimes the books have nothing to do with Witches at all, so I wonderd about this one. Now I know this novel sounds like one I would like to read.Great post. I am enjoying your blog very much!BTW, do you ever read any urban fantasy novels like those by Jim Butcher, Tanya Huff, Charlaine Harris, etc.? I ask because that is the genre I read most often. I’m glad you enjoyed it. I think it was Dovegrey reader who recommended it to me and it was one of those books that I simply couldn’t put down. I’ll certainly be on the look out for anything else she writes. Like you, I was intrigued by the memory theme and so I’m grateful for theother books that you’ve mentioned here, thanks. I had no idea Emerson had senile dementia. I know he got very forgetful towards the end but I didn’t know it was that bad. Hopefully it will talk about that in the bio I am reading about him. Laura, no I’ve never read any books by those authors.Ann, memory is intriguing – once it’s gone are you the same person?Stefanie, Shenk gives a most poignant account of Emerson’s slow, progressive dementia, which because it was so slow he was aware of for many years.